Last night we celebrated K's birthday by inviting my parents and his mum and auntie over for a dinner. We started with this bright and nourishing beetroot soup, followed with a filling boeuf bourgoignon to please my dad (he did enjoy the beetroot & ginger cake he was served last time he visited, but he was still disappointed that there was no 'proper food' last time). We then entertained our dear guests with Piña Colada Espuma (second helpings for all the ladies, and if my dad hadn't been the designated driver, he would have probably helped himself to the seconds, too), and finished with a cup of coffee and a fancy peach souffle made by the birthday boy himself. A very enjoyable evening indeed.. I wrote about a beetroot soup only recently (Vegetarian Borscht, September 2007), but this is totally different, and just as nice. The recipe is straight off the Finnish Ruokala.tv site - Punajuuri-vuohenjuustokeitto* - the only difference is that I weighed the parsnip and celeriac to make the recipe more 'exact'. Not that it's necessary here, so if you wish, just play around with the amounts of various root vegetables in the soup. Also, the original recipe suggests you crumble the goat's cheese into the soup to make it more creamy, but I had bought a wrong goat's cheese for that purpose, so I just sliced the cheese and placed on top of the soup. Maarja Sloveenias tegi ka seda peedisuppi ja kiitis heaks. Loe lähemalt siit. Peel the onion and chop finely. Peel the beets, celeriac and parsley, and chop finely or grate coarsely. Heat the oil in a heavy saucepan, add the onion and saute for about 7-8 minutes, until it starts to soften. Add the beets, celeriac and parsnip and heat for a few minutes, stirring every now and then. Add the hot bouillon, reduce heat and cover. Simmer for 20-25 minutes, until vegetables are softened. Cool a little, then process with immersion blender until smooth. Add the crumbled goat's cheese (reserve some for garnishing), season with salt and pepper. Divide into small soup bowls, garnish with extra cheese and some herbs. Love the combination of beets and parsnip -- sounds oh so sweet, and a delicious way to celebrate K's birthday! Aga see supp saab mu menüüsse reedel. I did think: 'Pille did something like this recently' so thanks for pointing out that's not the case. :) I love the sound of different vegetables in it, and I'm a huge sucker for goat's cheese. Hope K had a very happy birthday! You know I had two beetroots in my shopping basket today but for some reason I put them back - was rather intimidated. But now I wish I hadn't. This soup sounds delish! I make beets with goat cheese but I haven't tried it in a soup before. Thanks for the idea, Pille! 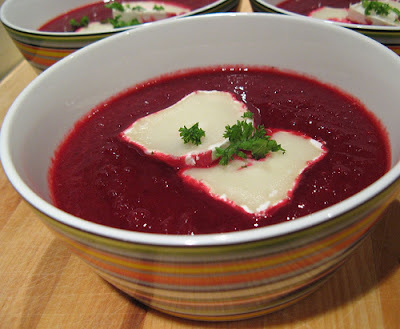 I love goat cheese, but never thought of adding it to beetroot soup before. Great idea!!! I'll try this recipe for sure!!! Happy belated birthday to K! My better half hates beets but I wonder if the word goat cheese might sweeten the pill!! Please, tell us more about the peach souffle! Lydia – beets and parsnip lend a lovely sweetness to the soup indeed. 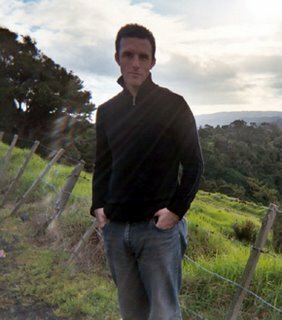 Maarja – mida reedel tähistate? Meeta – beets aren’t intimidating at all!!! Katie – I’ve been only eating goat cheese for a few years, but it’s definitely a great ingredient! Karolcia – give it a go! Tartelette – goat cheese might just do the trick! And I’ll ask K to tell you more about the peach souffle one day soon! Reedel ei tähista suurt miskit, ainult mu lillkapsa-kõrvitsapüree supp on tänaseks otsas ja saan endale uue meisterdada. Lihtsalt see kurblooline lugu, et kuni uuringuteni järgmisel nädalal olen ma lihalt maas ja siis olen selline poolenisti taimetoitlane. Happy (belated) birthday! This soup looks phenomenal! Something about beets and goat cheese...yum! Pille ~ I love the tangy quality of goat's cheese and its interaction with the sweetness of beetroot. I think they marry well because of their underlying earthiness. This soup looks wonderful, and I love that the recipe calls for parsnip, an under-rated root vegetable (and one of Eric's most favourite). What a beautiful recipe. I'm a huuuuuuge beetroot fan. I've made beetroot soup before, but never thought to put goat's cheese on top. Thanks for this. And thank you for visiting Limes & Lycopene too - glad you liked the look of the chocolate & beetroot cake! Mann - ega poolenisti taimtoiduline olemine nüüd nii paha polegi. Me sööme ka liha nii 1-2 korda nädalas, ülejäänud aeg ikka taimne toit..
Chris - thanks for your birthday wishes for K - I'll pass them on. And yes, beetroot and goat cheese make a good pairing. Kathryn - thanks for sharing such an interesting beetroot recipe with your readers! will do this soup Pille. and i have baked them yr apple cake.